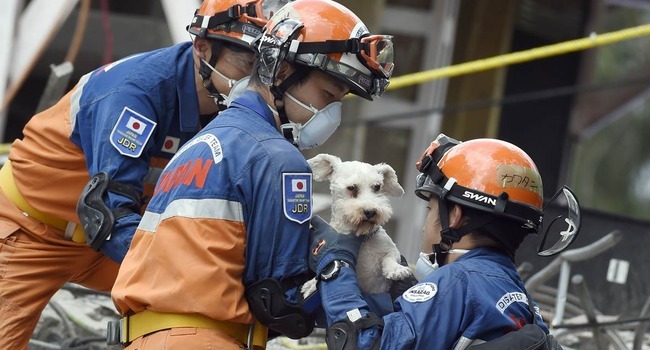 A Japanese rescue team searching for quake survivors in Mexico City found a ray of hope for the nation in the form of a small, white dog. At least 320 people have perished in the massive, 7.2 magnitude earthquake that struck Mexico City, but this week a Japanese rescue team pulled a sweet, small survivor from the rubble — six days after the buildings all fell. The little white dog was comforted by members of the crew while others continued the search for survivors. It appeared to be doing quite well upon a quick examination by paramedics from the Red Cross. Rescuers hoped they might reunite the pup with its owner.